$15,000 Up For Grabs This Weekend at The Savage Performance Footbrake 150 Presented By BTE. This is the 3rd race of the Big Check Points Series. The 2019 race is well under way and as we close out the first Texas Triple Tens we are already rolling into one of the biggest Footbrake races of the year this weekend at Gulfport Dragway. Race promoter Gaylon Rolison Jr. has put together a great event that has the big money Footbrake racer in mind. 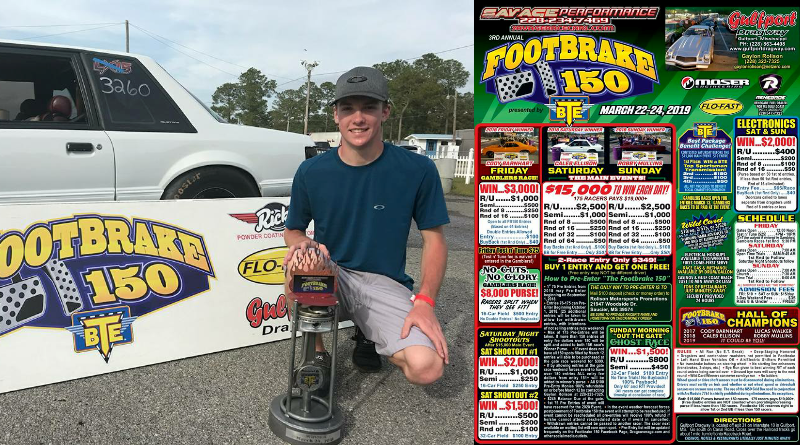 The Savage Performance Footbrake 150 presented by BTE offers over $15,000 to the winner of Saturday and Sunday’s main event at a low price of $349 to enter. The weekend will kick off Friday with the gates opening at noon and test and tune starting at 4 pm. If you enter the gamblers race your test and tune is free and the race will begin at 5:30 pm. Once the first pair of race cars reach the water box, there will be a lot of great racing action to follow. Friday night will have two gambler’s races, one offering $3,000 to win and the No Guts No Glory Gambler’s race. Based on a 16-car field, and a $500 entry, racers will compete for an $8,000 purse. Keyword being purse, because racers will “split when they see fit”. Saturday and Sunday will feature the main event with over 150 racers entered for a chance to win over $15,000. The Savage Performance Footbrake 150 presented by BTE will allow up to 175 racers to compete in the main event Saturday and Sunday and will pay over $19,000 if the 175 entry mark is met. Another great reason to participate in the Footbrake 150 is the BTE Best Package Benefit Challenge before Saturday’s Main Event. For a low entry of $10, the racer with the best package will win a BTE Top Sportsman Transmission. The 2nd through 4th best packages will take home cash prizes. All of the net proceeds will benefit the Breast Imaging Fund of Memorial Hospital that supports women who can not afford to pay for breast cancer prevention procedures. The Savage Performance Footbrake 150 presented by BTE will also feature two Saturday night shootouts based on a 32-Car field and a Sunday morning “Out the Gate” race. The “Out the Gate” race will not include a time trial, will have a 100% payback, and only the 60’ and R/T will be provided. The main event features some of the toughest footbrake racers from around the country, but if you are not a footbraker, electronics classes will also be available on Saturday and Sunday. In addition to the large cash prize racers will also have the option of signing up for the Big Check Bracket Points series. For only $50, racers can enter a points series that will award a big check and a big money bracket race Gold Card for 2020. Racers can sign up with Ryan Gleghorn in the tower and will have until the start of first round each day to sign up if they want to claim points for that race day. The best ten race days of the first twenty will go towards each racer’s overall total to determine a winner. No doubt if you swap feet then the Footbrake 150 in Gulfport is the place to be this weekend. Race promoter Gaylon Rolison Jr. has created a great event for Footbrake racers and would like “to thank everyone in advance for coming. The weather forecast is perfect, and we have some open spots left. We are sitting at 158 spots right now”. They will take up to 175 spots, so get your trailer loaded and your name on the list while spots are still available. Contact Gaylon at 228-323-7235 to get in! For more big money bracket racing coverage on DragChamp, click here.